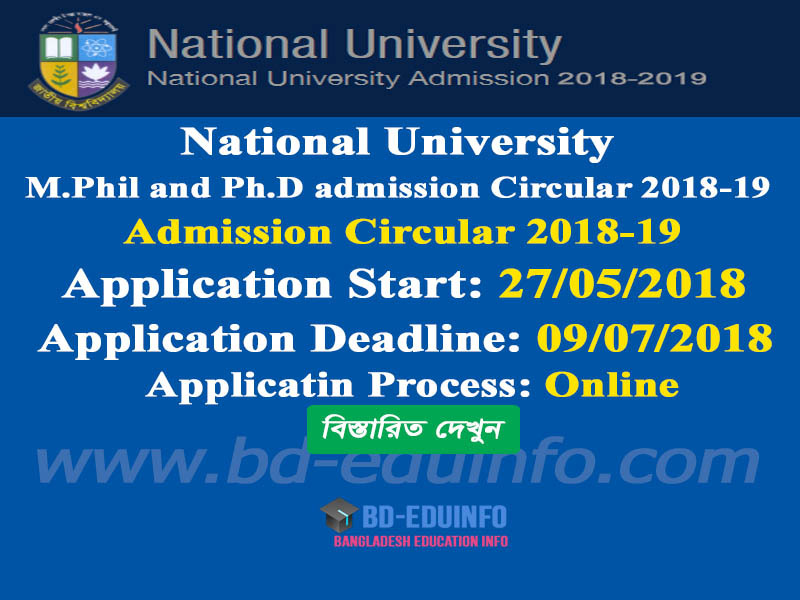 National University M.Phil and Ph.D admission Circular 2018-19 session circular has been published. Application start at 27 May, 2018 to will be continue up to 09 July 2018. Every eligible student can apply below instruction. 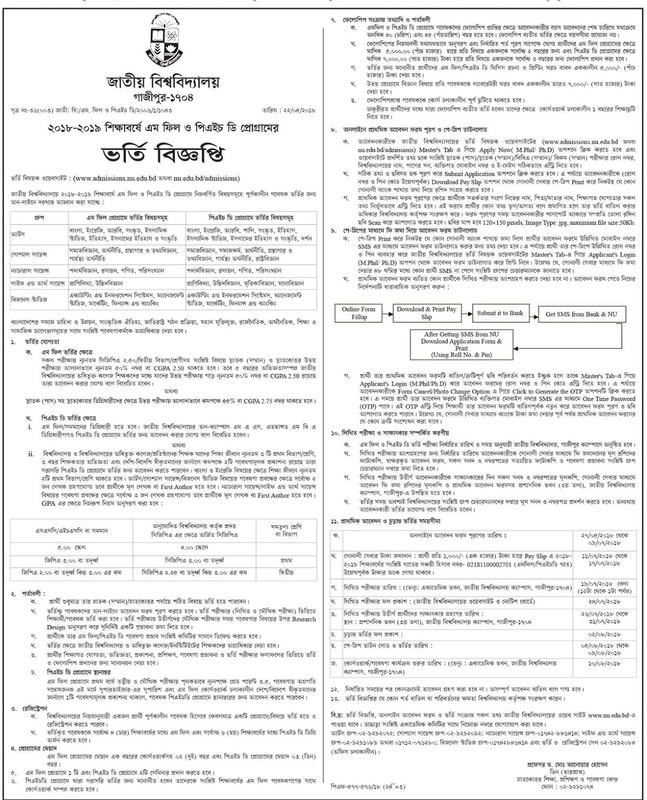 Any Interested and eligible applicant apply through National University official admission website http://www.admissions.nu.edu.bd/ or http://nu.edu.bd/. c. Input your Graduate (Honors)/BBA(Honors)/B.Com (Honors) Exam Roll, University Name, Passing year, Personal Mobile Number and Email Address put correctly. 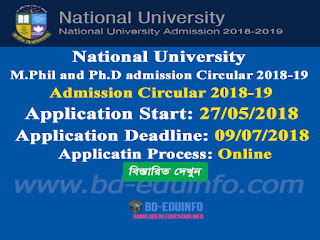 National University M.Phil and Ph.D admission result after deadline over will be published Natiaonl university admission official website http://www.admissions.nu.edu.bd/ or http://nu.edu.bd/. Also you can found your result Mobile Phone SMS system. National University M.Phil and Ph.D admission result will publish on 24/07/2018 at http://www.admissions.nu.edu.bd/ and University Notice board at http://nu.edu.bd/. Tags: www.admission.nu.edu.bd, www admission nu edu bd, nu.edu.bd/admissions, nu edu bd admissions, nubd result, nu M.Phil and Ph.D admission, national university M.Phil and Ph.D, nu bd M.Phil and Ph.D admission, nu admission M.Phil and Ph.D, M.Phil and Ph.D in national university bangladesh, National University Bangladesh M.Phil and Ph.D admission, nu bd result, nu admission, nu bd result, national university application, national university online application, national university online admission, national university online, national university application form, national university M.Phil and Ph.D, national university degree admission, national university mba admission, masters admission, national university mba, honours admission, national university llb, M.Phil and Ph.D in national university bangladesh, national university bangladesh routine M.Phil and Ph.D, national university masters private admission, national university masters admission news, national university masters admission notice, nu masters admission result, nu honours, national versity, national university admission requirements, national university, mba under national university bangladesh, llb pass course in national university, dhaka college masters admission notice, masters admission notice, national university application form download, previous masters admission, national university online registration card download, mba syllabus national university bangladesh, dhaka university evening masters admission, bangladesh university ranking. www.admission.nu.edu.bd, www admission nu edu bd, nu.edu.bd/admissions, nu edu bd admissions, nubd result, nu M.Phil and Ph.D admission, national university M.Phil and Ph.D, nu bd M.Phil and Ph.D admission, nu admission M.Phil and Ph.D, M.Phil and Ph.D in national university bangladesh, National University Bangladesh M.Phil and Ph.D admission, nu bd result, nu admission, nu bd result, national university application, national university online application, national university online admission, national university online, national university application form, national university M.Phil and Ph.D, national university degree admission, national university mba admission, masters admission, national university mba, honours admission, national university llb, M.Phil and Ph.D in national university bangladesh, national university bangladesh routine M.Phil and Ph.D, national university masters private admission, national university masters admission news, national university masters admission notice, nu masters admission result, nu honours, national versity, national university admission requirements, national university, mba under national university bangladesh, llb pass course in national university, dhaka college masters admission notice, masters admission notice, national university application form download, previous masters admission, national university online registration card download, mba syllabus national university bangladesh, dhaka university evening masters admission, bangladesh university ranking.